The special valve assemblies that Nooney Controls builds for their customers often require access around the full perimeter of a large valve. Nooney uses an open shop concept that allows primary valves to be placed at the most convenient location in their shop area depending on the work required for that assembly. Wayne Sekell wanted mobile workstations that could be moved to each area for work on valve assemblies. 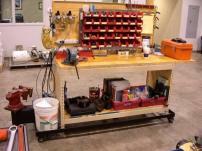 Preferred Equipment provided easy-to-assemble work benches with plywood top and back panels. 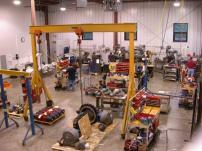 Nooney personnel then fabricated custom dollies with an attached vice that allowed the bench, complete with tool kit, parts bins, and test equipment, to be wheeled to the valve to complete the required customization.